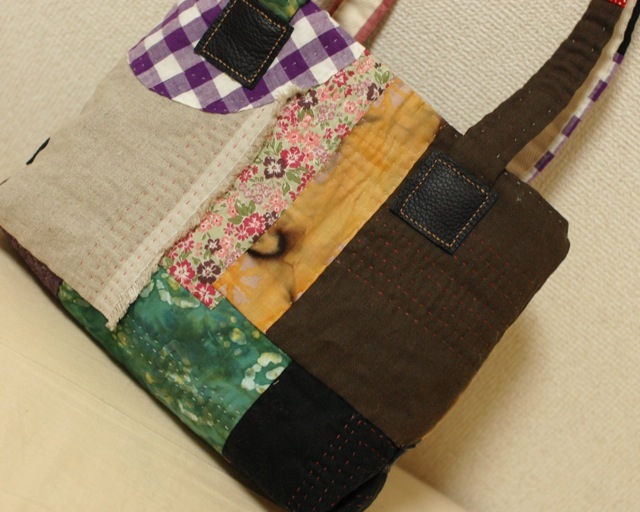 Today I finished this bag. It's for my mother. She turns 60 years old in Christmas. We Japanese celebrate age 60 especially(It's called Kanreki). 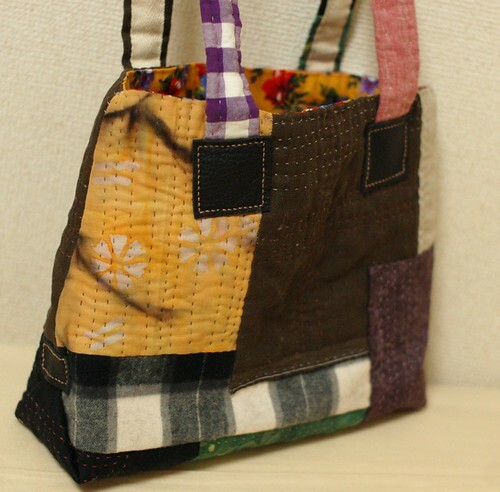 We are having a short trip in the end of this month and I want to give her this bag. I patchworked kinds of fabrics, cotton, linen and wool. Some are from my friends. I also put some pieces of leather. 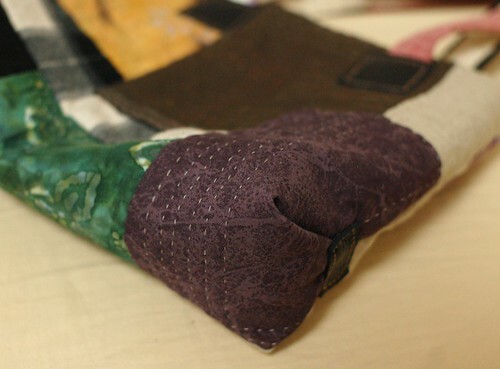 The hand stitch on leather took the longest time. Anyway, I worked on it for three days... I'm content with the result. It's getting cold in Japan these days. So we cannot see Bo-chan usually because he is in his house. But yesterday, we found his eyes from this tiny gap. An old lady talked to him like us too. 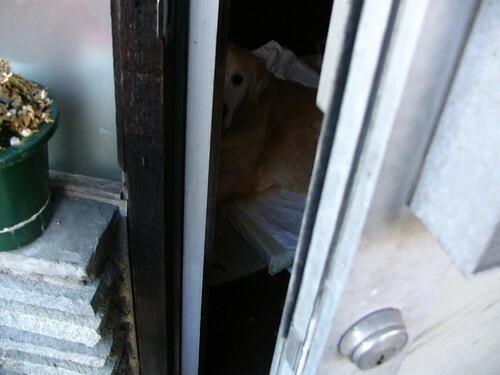 He cannot stay outside, but he can enjoy talking with people through this gap (* v *)! 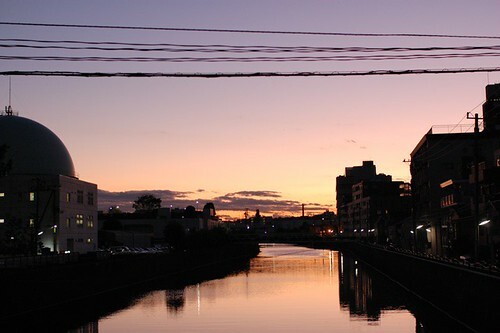 After that, we saw beautiful sunset. It's a beautiful day as always (* v *)!!!!! The bag is beautiful; I'm sure your Mother will cherish it. I think it's lovely that in Japan they appreciate and celebrate longevity. Will your Mother wear a special red outfit? Thank you for sharing your sewing artistry with us. The bag is really beautiful, I'm sure your mum will love it! Wow, you have been busy! I love the bag for your Mom and the cute little covers for a house key...fantastic. Thanks for sharing all the pictures. Jodi B. Your hand-stitching is *wonderful*! The bag is beautiful, and I'm sure your mother will be happy with it. I love seeing your posts. Thanks for sharing your creativity with us on the web! I really do appreciate your art and you do so so many beautiful things. And you don't even use the sewing machine... wow! This bag is really nice, your mother must be happy! What a beautiful bag, and I'm sure made with so much love. Your mother will be very happy with it!! Very nice and original this bag!Congrats! Your Mother must bo so proud to have a daughter as lovely as you. You are a good daugher. The bag is so beautiful. Bo-chan is wise to stay inside out of the cold. It has been 32deg celsius here in Brisbane/Australia the last 2 days. Bring on the cold I say. stunning bag!! any chance you will do another for sale? Thank you for the Bo-Chan update. Bo-Chan look just like my Golden that past away last year. so I have a special feeling for Bo-Chan. I love the bag you made. I like the balance of all the textures .Nice work. I made a post about your blog in mine. I really love to read you and wanted to share the link with my readers. Nice story as for me. It would be great to read something more about this topic. I am happy that I am going to learn something new. you have the most wonderful ideas! How to make a string quilt pouch.